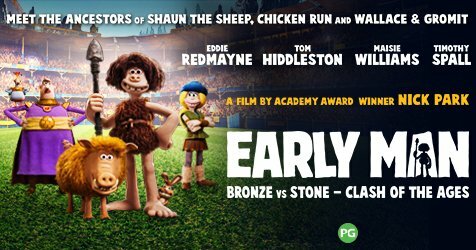 Early Man is the hilarious new prehistoric adventure from four-time Academy Award-winning director Nick Park and Aardman Animations, the creators of Wallace & Gromit and Shaun The Sheep. Shot in Aardman’s own distinct style, the film will take audiences on an extraordinary journey into an exciting new world and unleash an unforgettable tribe of unique and funny new characters. Early Man tells the story of courageous caveman hero Dug and his best friend Hognob as they unite his tribe against a mighty enemy to save their home.